Yesterday, I received my package from Improveat of Pure Wraps. I had been anxiously awaiting it’s arrival! After first reading about these wraps on nom nom Paleo‘s site and seeing her delicious creations, I had to get my hands on some. 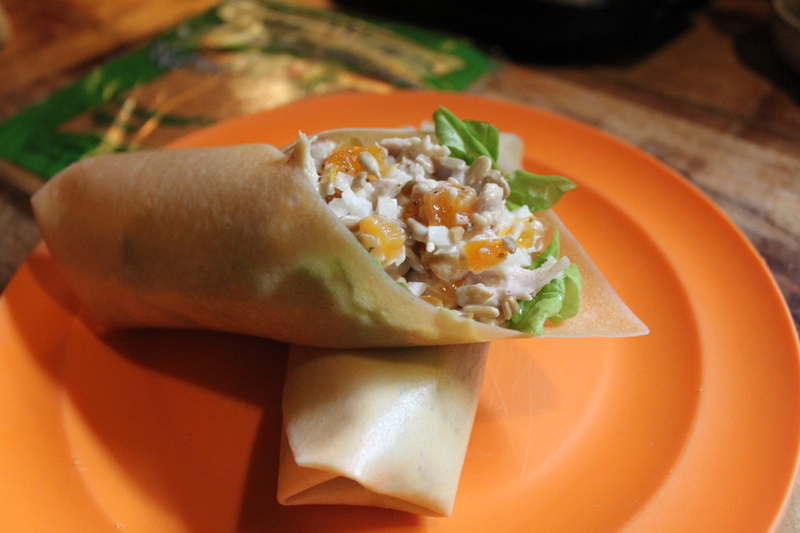 Not able to contain my excitement or the desire to try them as soon as possible, I made my Paleo Chicken Salad (recipe coming) and wrapped it up for lunch today. I had read that some people didn’t like them because they are kind of thick and a little greasy, but neither of those things were an issue for me. In fact, I found them to be more thin than thick. I think they are perfect! They have a slightly sweet flavor to them, and I love the texture. They do not fall apart and even kind of cling to themselves helping to hold the wrap together. Sandwich cravings be gone! These wraps are an easy way to get a “old school” feeling lunch. These are soo good and at only 4 per package, I have already placed another order! This entry was posted in Chicken and tagged Chicken salad, Improveat, Pure Wraps.